Whether on the job or in private: nobody should notice you are wearing braces? With the support of braces on the inside of the teeth (lingual) or with almost invisible aligners from Invisalign, this is possible. The orthodontist Dr. von Rom in Unterföhring specialises exactly in these treatment methods. This type of brace is fastened on the lingual side of the teeth. The bracket is completely hidden from plain sight and is the most inconspicuous type of braces. What advantages does the invisible brace on the inside have? Using lingual orthodontics mandates that every brace is individually customised for your teeth and jaw structures. This enables precise target positions to be determined in a comparatively short amount of time, resulting in an optimal treatment outcome. The braces are completely invisible throughout the duration of the treatment. Irritation of the cheek mucosa that typically is propagated by use of classic braces on the outside is completely omitted with lingual braces. The individual and fully customised design and manufacturing process of each bracket and wire leads brace that is thinner than a conventional one. This helps the tongue to acclimatise to the lingual brace quickly and easily. The lingual brackets distinguish themselves by having larger base plates. A direct result of having the invisible braces is larger protective coverage of the teeth, in turn offering greater protection against tooth decay. What misalignments of the teeth and jaws can be addressed with lingual braces? What differences are there between the lingual technique and the classic braces? In our specialised practice we are more than capable of treating complex cases with the lingual appliance, setting ourselves no boundaries. The lingual brace grants the same treatment possibilities to that of the classic brackets. The treatment as well as the production methods of these customised brackets are more elaborate. Thus, the cost for the lingual brackets are comparatively more in relation to conventional outer brackets. In return, you receive a completely invisible treatment with individually tailored braces, which makes the treatment even more precise and the outcome more predictable. Are there different bracket manufacturers for this technique? The Incognito Brance and the WIN Brace. In our orthodontic practice in Unterföhring Munich we utilise lingual braces from the leading manufacturers Incognito and WIN. Both manufacturers distinguish themselves from the competition by offering a uniquely flat design. This guarantees a high degree of comfort. After a brief acclimatisation period there are no constraints left for the patient to deal with. The brackets and wires that are located on the lingual side are both custom fitted for yourself and your situation by both manufacturers. The braces from WIN and Incognito differ amongst other things in the production method and the final material. Whilst WIN produces lingual brackets out of silver-coloured alloys, Incognito brackets are made of an gold containing alloy. Invisalign is a brace that omits the use of metal brackets. Instead the teeth are relocated by a thin see-through aligner. 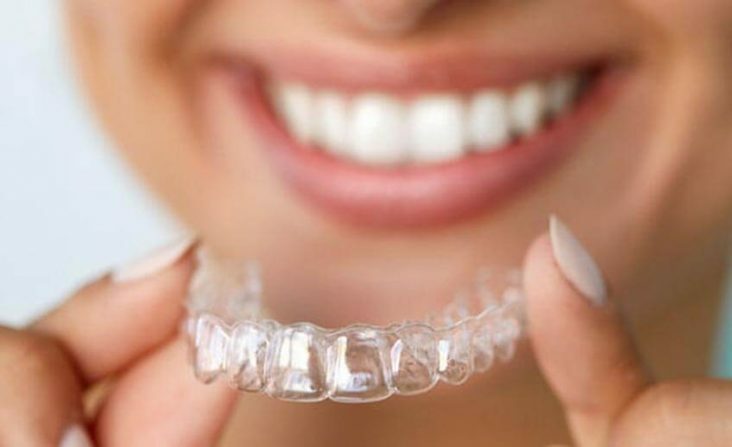 The clear mouth guards are custom fitted, fitting your teeth like a glove, making it difficult for onlookers to even notice you are wearing Invisalign braces. When would the use of Invisalign be considered? We generally recommend in our specialised practice the treatment with Invisalign particularly in moderate malalignment cases. To name an example, in the case of slightly crooked incisors. Invisalign aligners are removable. During the treatment with these clear aligners nothing is holding you back to eat or brush your teeth without them. You can go about your day without having to deal with any limitations. Dr. von Rom is officially certified for application of Invisalign braces.